I wanted to revisit and oldie, but a goodie today. The downside to this is this isn't something you can find easily anymore. That being said I've seen it listed on ebay and Amazon for reasonable prices. I cannot attest to the reliability of the sellers, but I wanted to throw it out there! I re-discovered this one thanks to my friend Alyssa over at Pretty Little Bottles. There are times when I can't decide what to paint my nails, so I'll text her and tell her to pick a number 1-19. I have 18 Helmer drawers, and one extra plastic container for odds and ends polishes (this holds polishes I only have 1-2 from a brand). The number she picks I'll pick a polish from that drawer. 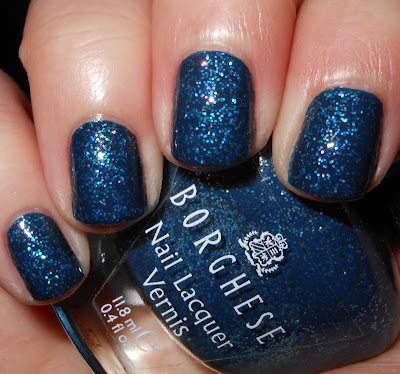 This time she picked #19, which was my odds and ends drawer of polishes, so I picked Borghese Mediterraneo Sea. I haven't worn this polish since it came out in 2010. Meditteraneo Sea is a medium blue base with multi colored small hex glitter throughout. How could I have forgotten this beauty?!? This is a stunning polish. I don't know how to describe it. It kind of looks like sea glass with glitter, stained glass, or tiles you see in a Grecian or Roman bath? Whatever it looks like it's beautiful. This does dry matte, but I think it is so much prettier with top coat. A top coat allows the glitter and the base to really shine and sparkle! this is gorgeous! I've passed it up so many times but now I'm regretting that. This is so beautiful! I always admire glitter polishes, but just do not love the removal process. I generally shy away from purchasing glitter polishes for this reason. I do have some glitter polishes, but wear them very infrequently. This one is really very pretty. This is really pretty! It's very unique too. That's beautiful! And I love the way you described it! Oh wow, this is indeed so beautiful!